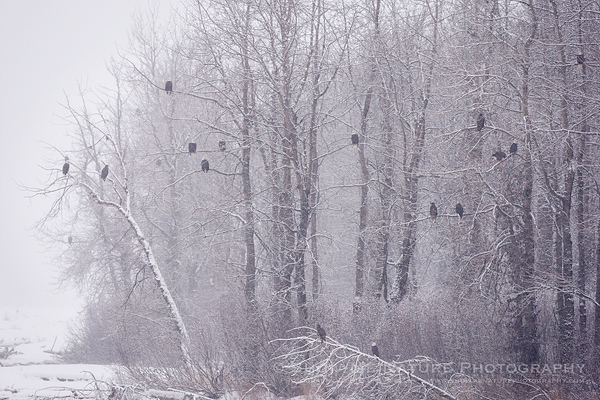 Bald Eagles are typically “loners”, but during the winter, they are quite communal, as evidenced by the above image. They become very tolerant of each other during winter, with the only exception being when food is present. When an eagle flies nearby with food, often many eagles join in on the chase to take the food away from the bird. Pirating of food from other eagles often requires less energy than catching food by oneself. Tags: 2014, Alaska, Bald Eagle, behavior, bird photography, birding, birds, birdwatching, Blog, Chilkat River Valley, fall, Inside Passage, nature, nature photography, photography, travel.